Update: Photos depicting the horrific abuse Foster inflicted upon his ex-partner have been released. The pictures show Ms. Ennis with bruises on both her face and chest. Yet, unbelievably, police have dropped charges against Mr. Foster making it more likely than ever that he will begin playing with the Washington Redskins in the near future. This is not right! Continue to share this petition and demand that companies like FedEx, Bud Light drop their partnership with the Redskins until they drop Foster. On Saturday the 24th of November, police were called to the Grand Hyatt in Tampa Bay, Florida where they found a couple engaged in a tense verbal altercation. The man was arrested after his female companion told police he had "pushed her in the chest" and "slapped her with an open hand." 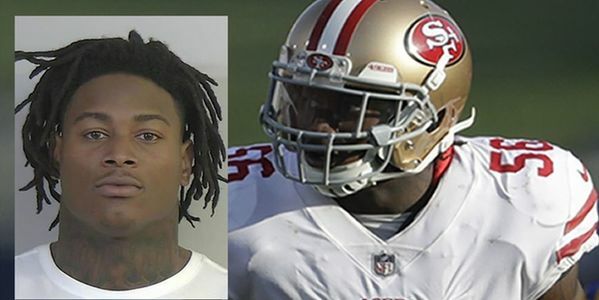 The accused was none other than 49er's linebacker Reuben Foster who had, by then already had three run-ins with the law this year, 2 of which were for domestic abuse. For the 49ers, his most recent act of violence against women was their last straw. So, just hours before their game against the Tampa Bay Buccaneers he was released of his contract — making him a free agent. In any normal industry that would be the end of it. The employee would be sent packing, never to show their face again, but NFL teams and the league itself is different. When it comes to domestic abuse the motto is "if you can help us win, who cares?" At least that's what it seems like, especially considering the fact that just days after Foster was kicked off one team, another team's said they would be glad to hire him. The Washington Redskins — possibly football's most controversial team — said they would offer Foster the remainder of his original contract. Luckily, it isn't that easy, when Reuben was released from the Niners the NFL quickly put him on the commissioner's exemption list blocking him from practicing, playing or even attending games until the league has completed a thorough investigation into the serious accusations. By signing Foster the Redskins have chosen winning over women. It's a shocking move, especially considering that the Women of Washington Redskins is the largest all-female fan club in the entire NFL. But despite this, the team has decided to turn a blind eye to Foster's serious transgressions. This is unacceptable. Like every business, the Redskins have an obligation to act morally especially when it comes to fighting domestic abuse. But if they won't do so, then the companies that help them make millions through sponsorship should. That's why we are calling on FedEx, Bud Light, Bank of America, PepsiCo and Safeway — some of the Redskins' biggest sponsors to drop their partnership with the football team until and unless they refuse to hire Reuben Foster. Please take a stand and sign the petition.